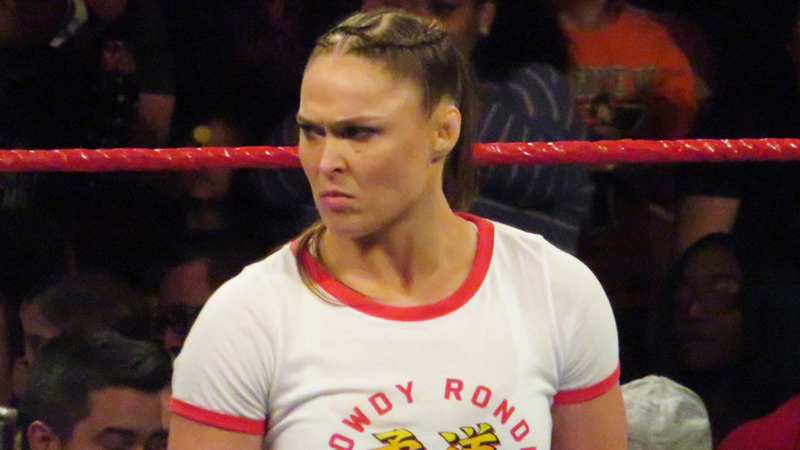 WWE Superstars Sasha Banks and Ronda Rousey have taken to social media to vent their frustrations with one another, as their personal feud intensifies before their RAW Women’s Championship match at the Royal Rumble. During this past Monday’s episode of RAW, Banks threw up the number four (for the 4 Horsewomen) while she and Rousey were involved in an intense stare down. The 4HW is about changing the perception of women’s wrestling in the WWE. Its about walking into an arena full of people, including some of the people in the back, who’s expectations are lower than low, and knocking them on their asses. Showing the whole world that ” I was born to do this ” isn’t some catchy line, but a promise to them from me, that as long as I have a breath in my lungs, I will never go less than 100%. That’s why I throw up the 4 fingers. You throw them up cause you’re a fan… That’s the difference between you and I Ronda Rousey. After Royal Rumble you can go back to sitting in the crowd where you belong. Wrong. Sasha Banks, Everything you just said was about YOU and what YOU do. As an individual… you haven’t even begun to grasp what the 4 Horsewomen truly represent. The REAL 4 Horsewomen Shayna Baszler, Jessamy Duke, Marina Shafir and myself are about camaraderie, we’re about loyalty, we’re sweat sisters bonded in blood we’ve shed together in the pursuit of a common goal. When any of us succeed, we rise together. If any of us fall, we dive to catch each other. When at our highest highs we hoist each other even higher into the air. When at our lowest lows we dust each other off and empower the sisters at our side to take another defiant step forward. You’re a bickering quarreling thrown together corporate copy of the lighting we’ve captured in a bottle. We’re real friends, we’re real sisters in arms, we’re the dose of reality to has come to dispel the fantasy that is your FAUX horsewomen. Rousey and Banks look to settle their differences on January 27th at the Royal Rumble.